What can I do to help? - Adventures with the Tuleys! 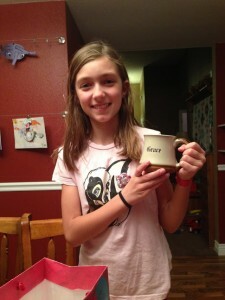 Yesterday (October 8th) was Grace’s birthday. She had a great day – getting overnight rolls for breakfast, Chinese takeout for lunch, and banana bread for her birthday cake. We didn’t do anything overly special, but had a good day at home together. Three years ago it was hard for us to make her day special. We were still in the hospital with Josiah, and it was one of the more difficult days, with medication challenges and running a fever. 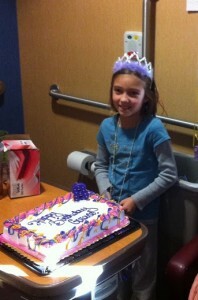 But because we have amazing family and friends, Grace had probably one of her best birthdays ever that year. 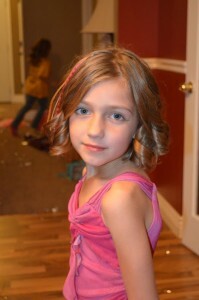 She had a birthday/sleepover party with three of her friends at our house on a Friday night. My sister-in-law and two of our friends stayed at our house for the evening/night to be there with them. A friend also made special birthday sugar cookies. 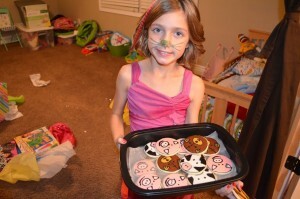 (Her cookies are the best!) This was a party Grace had planned herself and when we told her before the surgery we weren’t sure what the plans would be for her birthday she was in tears; however because people were willing to step in and help, she had a wonderful birthday! 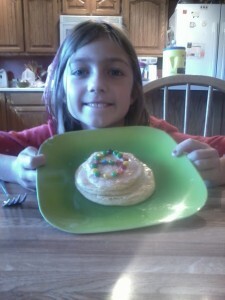 Nathan’s parents then took Grace, Samuel and Ruth Ann with them to their house for the weekend, and Grace was treated with a special breakfast pancake on the morning of her birthday. Being at their grandparent’s house is a common activity for them, so it was nice knowing she was in a familiar and happy environment for her birthday. Later that day Nathan’s parents brought the kids to the hospital so we could spend some time with Grace on her birthday. Nathan had went to the store to get her a gift, but we really hadn’t planned a whole lot else. We were very surprised when friends showed up with a “Party in a Bag” which included balloons, cake and party favors! We had all we needed for a party! Sometimes, when a loved one is going through a difficult situation – like we were with Josiah, it’s hard to know what to do. To be honest, when I was asked “What can I do to help?”, I didn’t know how to respond. I was where I needed to be. My focus was on being at the hospital and keeping up with doctors and results as well as caring for Josiah. Our family was held together by family and friends who kept up with the daily routines and “life” for our kids at home. Our church held a prayer service the night before Josiah’s surgery. It was very encouraging to us when people shared with us how our story was impacting their lives. Nathan and I’s mothers took turns every Monday to be with our other children when Josiah had chemo. 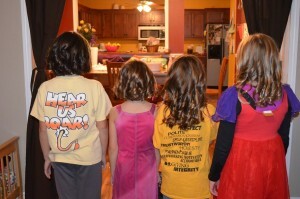 While in the hospital post-surgery, they each took turns being at our home and alternating weekends at their homes. They did a wonderful job maintaining a normal routine for our kids. People offered to do fundraisers, gave anonymous gifts, and sent cards or money in the mail, gift cards and meals (both at home, and picking up and bringing meals for us while we were at the hospital). Including our other kids with gifts or even better, offers to play at the park or getting ice cream with family friends was an enjoyable treat. It made our other kids feel special and important, and gave them something different to do with their day. Grace’s birthday being the perfect example of this type of service. It was great having visitors come and pray with us while in the hospital. We were in the hospital for 28 days, and the only day we didn’t have a visitor was the day we went home. The family that planned to come visit that day stopped by the house and dropped off a gift before we made it home. Even if someone came by for a few minutes on their lunch break, it meant a lot and it helped break up our day. I believe that the front desk didn’t even have to look Josiah’s name up to find out where our visitors needed to go! Prayer. Prayer is HUGE! There were days I KNOW I was carried in prayer. I felt it. And I felt the days I needed more. I know it’s a common phrase to just tell someone, “I’m praying for you.”, and sometimes it doesn’t feel like it’s enough; but most days, it’s honestly all I needed. A friend to help organize. Because we had so many offers for help and questions of “what do you need?”, a friend told me that she would take care of all the offers coming in. It was much easier to give my friend a list of things that were needed and she then took care of all the details and people. When someone would ask what we needed, I’d refer them to my friend, freeing up time for me to be at the hospital, where I needed to be. This was a huge weight off of my shoulders. Another important aspect to keep in mind is that many marriages struggle during times like these. I have no immediate suggestions, since we have been incredibly blessed to have grown closer during this time – (sounds like another good blog post!). However, it is an important thing to take note of, as we were told multiple times that many marriages do not survive after the diagnosis of a sick child. Continue to be there for the family; even when surgery is over, when chemo is completed. We didn’t have a lot of needs during the surgery and chemotherapy process. Some families do. We were blessed to have family close by who were able to help consistently. Since completing chemotherapy, our schedule isn’t as structured, but Josiah still has many doctor appointments. It’s wonderful to know that I can still call on the people who offered to help three years ago, and they’ll help with anything I may need. And many still offer to help, which is such an encouragement that they’re with us for the long haul. And to each of you who have journeyed with us, I say “Thank you” and I thank God for you. WANT BLOG UPDATES VIA EMAIL?